Here it is, the long awaited sequel to "The Balance Age", which contains everything from the old mod + a lot of new stuff. The goal, as always, is to provide a harder and not too straightforward game, meant to be enjoyed by players that are quite knowledgeable with the game mechanics and want to try other things than Megiddo & Summon Rush. But let's get into details. If you encounter freezes, crashes or other technical oddities, please try patching a different clean rom or try a different emulator before reporting. The emulator I use is VBA-M 1.8.0 SVN1243. Always include details about the emulator where you experienced the crash or freeze in reports and if the same happens in VBA as well. HERE instead you can find a txt file that lists every perfect class setup (hence, no djinn wasted) that can be created in TLA with this mod. Jenna and Piers have a completely new set of classes made almost entirely from scratch: Jenna's classes are mostly mage-ish while Piers' are mostly warrior-ish. Each class line has a Magic Resistance value (WRD in the class doc) that alters damage taken from Base Damage attacks. For example a 95% WRD means that a character in that class will take 5% more damage from Base Damage attacks. Characters: Characters' base stats and starting levels rearranged. Piers levels up faster. Stats gained at level up are fixed and unaffected by RNG. Characters' base stats were rearranged to balance them out and at the same time make differences between them more striking, cause those changes are (for the most part) reflected by the stat multipliers of the base classes. 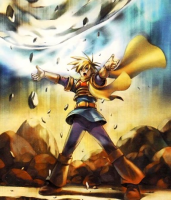 For example: Sheba is now everything that Ivan was: best caster and frailest character. Ivan also gained more attack. Piers improved with more PP and HP at the expense of Felix. Piers is also a better caster than Isaac now. Mia has now second best PP but also second worst ATK. Characters also have more innate HP (they gain less from Djinn though) to make them more resilient to summons; luck grows with levels to complement the changes made to the debuff mechanic. Leveling up doesn't depend on RNG anymore. In TLA, Jenna starts at 4 and Piers levels up faster (while still being the slowest). Items & Equipment: Weapon categories system, new items added, tweaked MANY others. Some treasures have been rearranged in TLA. New attribute "Ailments" found on equipment. The Golden Rule: Each piece of equipment found/bought in the game is stronger than anything (of the same type) you could find at an earlier point in the game and weaker than anything found later. Shops (and some chests) have been changed accordingly. Ailments boosts the chance to hit enemies with debuffs, negative statuses and anything else that requires a Luck check on the enemy. It directly increases the percentile chance by the amount shown on the item, just like how the Criticals attribute increases the chance to unleash. Unleashes: All attack based unleashes use multipliers. Unleashing mages are now a viable option. The standard unleash rate is now 30%. Armageddon's (Megiddo) multiplier is now x2.4, Ceres' Legend and Heaven Vengeance had their added damage part reduced. Some unleashes had their element changed. Among the most notable ones, Acheron's Grief is now non-elemental and High Vitals changed to Mercury. Every unleash of non-staff weapons uses a multiplier to increase damage. Staves' unleashes are all base damage type. New psynergies: Tyrfing (Venus equivalent of Quick Strike), Meltdown (Mars equivalent of Quick Strike), Waterspout (Mercury equivalent of Quick Strike), Rolling Fire (Stronger mars Ghost Soldier), Sabre Rain (upgrade to Pierrot's Sabre Dance), Punishment series (Stronger Jupiter Fume), Boon series (from DD), Heal series (Group healing Venus psynergies), Bravery/Courage (Venus Impact/High Impact), Blessing (clone of DD's Weapon Grace), Raise (Mars equivalent of Revive), Remedy (a single target Tonic). Poison and Paralyze are available. The new base damage formula is Damage = (Base Power + MaxPP/8) * Elemental_Factor * (1+(MaxPP/1024)). Group healing and reviving psynergies cost MUCH more, as well as the strongest single target healing psynergies. Reviving effects now have ALL a 100% success rate BUT Revive, Raise, Lich and Phoenix revive only to 50% HP. Water of Life revives to 25% HP. The Necromancer's Call Demon/Dullahan are base damage type spells. Call Dullahan is the strongest base damage psynergy in the game. The Pierrot's Card and Juggle series are also stronger. Frost Card is the strongest Mercury base damage psynergy in the game, Bramble Card and Thunder Card have a chance to debuff their targets. Drain and Psy Drain are stronger and never miss. Psy Crystal restores 200 PP. Endgame EPAs except Quick Strike, Tyrfing, Meltdown, Waterspout, Minotaur and Annhilation have a chance to debuff the target or to partially ignore defense. All EPAs are multiplier based, endgame ones are now closer in power to unleashes. Elemental Power doesn't affect healing spells as much as before (half of the original bonus/malus). Haunt triggering rate is 40%. Characters wrapped in Delusion can't unleash and regular attacks miss more often. Death Curse's countdown starts at 4 instead of 7. Resistance buffs and debuffs increase and decrease resistance by 15/30 instead of 20/40, and they cap at +-60 instead of +-80. Defense buffs and debuffs are stronger: buffs go from x1,1875 to x1,75 (in 4 steps as usual). Similarily, debuffs go from x0,8125 to x0,25. Single target buffs/debuffs have lower duration and base infliction rate than MT buffs/debuffs. Ailment infliction rate and ailment recovery chance aren't dependant on elemental level anymore. Luck higher than 40 grants immunity to stun and sleep. Djinn & Summons: Summon rushing isn't possible anymore, summons have been rebalanced. Most Djinn have improved, the strongest ones were nerfed. Djinn grant less HP. Chill and Mud's encounters swapped. Summons that require more than 2 djinn won't appear right at the start of a battle. After the first turn, 3-djinn summons become available; after the second, 4-djinn summons become available and so on, with Iris available after the 5th turn has passed (6 and 7 djinn summons are unlocked in the same turn). Enemies: Stronger in general. New enemies and new enemy abilities added. Full overhaul in TLA, with more enemies per battle on average. Every enemy has higher stats and those that uses psynergy have maxPP equal to their levelx5 (if it isn't already higher) so they can benefit from the PP Multiplier. For some enemies (especially in TLA), the element they're weak to got changed. In TLA enemies and enemy groups have been completely revamped from start to end. Treasure Isle overworld area now has enemies from the Eastern Sea lands. The Northern Reaches overworld area has a completely new set of enemies. Enemies use Break less frequently. Drops: Notable drops that changed from the original version. Forgeable materials are dropped earlier. *TLA Only. Also Earth Golems don't drop Giant Axe anymore in TLA. muchas gracias! con ganas de esta actualización. feliz navidad! First release of Golden Sun Reloaded IS UP! For the love of god, make a changelog. I know that like, everything is changed, but, I also have no real way of making sure that everything is changed the way you want it to be changed. Like the time Sheba's psynergy hit for summon power. Or resistance power text changes. Or free high levels drops on birds. Sadly i don't think i kept a detailed list of treasures rearranged, but the "Equipment's Golden Rule" is enough to tell if something isn't where it should be. Lemme know whenever you've put out a version you think it's worth doing a full playtest of. Alright, that sounds like a green light for me and anyone else who was waiting to do a full feedback run-through. Look for the beginning of it in the next week or two, no promises. If it's anything like the playthrough I did forever ago, expect complaints about sheba having the durability of wet napkins and djinn battles directly assaulting the well-being of the player with their difficulty and damage. I haven't tested anything myself but my opinion is that both issues are related only to the earliest part of the game... i'd say till level 10 at most. After that point you have already enough versatility to face almost anything that comes at you. About Sheba, i don't remember when you did your last playthrough but since TBA's v1.34 she has the best "Magic Resistance" stat in her base class, reducing all base damage taken by 15%. I don't know if I'll play your hack. I'm getting tired of playing GS. I cleared the games a good 15 times now. Did you correct the Caladbolg ? I remember that it was a pretty bad weapon in Balance Age compared to when you could find it. @Caladbolg: I remember you telling me about it and i remember making some changes but not the details: it's been 6 months after all. Just got access to the ship and my first destination in the eastern sea is yallam. Hmm I have trouble changing in Tri-elemental Classes. Felix with 3 3 should be a Shinobi right? But he stays as a Ruffian!? You are correct, and I already know why that happens, but sadly I can't work on a fix today. Thanks a lot for reporting and sorry about that, it's due to a very stupid mistake of mine.